Could the world’s biggest business opportunity be transforming the planet into a Digital Earth that helps everyone succeed? It’s hard to imagine the digital world has only begun, but market leaders and startups need powerful new tech to get ahead. Small improvements aren’t enough. They need to accelerate and lead the future. Consider leading the World: The biggest business opportunity is transforming the Earth into planet where everyone can succeed. Expandiverse Technology is the first opportunity to build and lead tomorrow’s Digital Earth rapidly. Today’s advances are so fast, market-leading products and services can be made obsolete in no time. 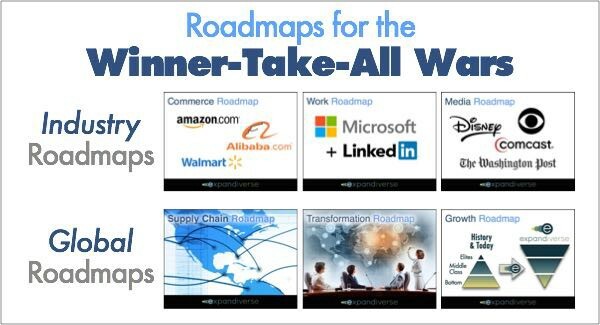 Today’s world-leading companies can retain market leadership — and ambitious startups can see how to capture and lead new markets — by considering Expandiverse Roadmaps from Digital Earth 2025. These evolve industries such as devices, communications, networking, social media, search, advertising and commerce. 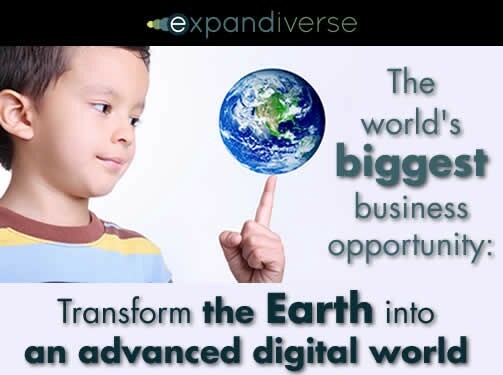 Instead, the Expandiverse provides new opportunities for companies to be the market leader that captures our fast-arriving Digital Earth. With it leading companies can stay ahead, challengers can take market share, and startups can capture new emerging areas. Start wide. Next, win everything. Due to network effects, digital platforms are winner-take-all. 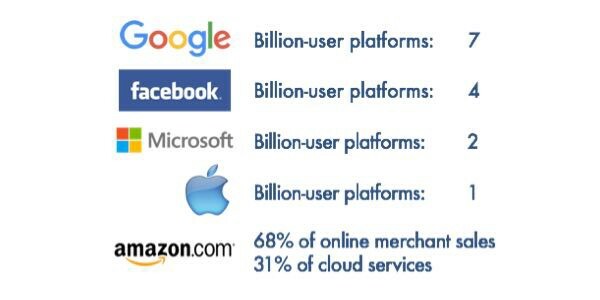 Today’s billion-user platforms are from Google (7 platforms), Facebook (4), Microsoft (2), Apple (1) and Amazon (68% of online merchant sales). But today’s platforms are created by pivoting to find traction, then scaling. These platforms transform industries. The coming big surprise is a Global Digital Transformation that will converge life, work, business, entertainment and everything connected. This will force the billion-user platforms — and other leading companies — to battle for digital dominance. Their collisions will converge countless companies and industries. The result of that crushing conflict is likely to be a new digital infrastructure that lasts for decades, with long-term winners and losers. The result? Picture being ruled for decades by one or a few of today’s leading companies. A tech-driven shift is coming in control of screens, leading to a new Partnership Capitalism. Users are already taking control by using ad blocking, which shuts down the major revenue source for many parts of the Internet. This Expandiverse component is user-controlled Digital Boundaries, because users already have the right to choose what their screens display. This lets users make their choices as instructions, then computing delivers what each person chooses. Users will decide which ads, content, logos, images and video their displays prioritize, and what they block or replace. Each user will also decide which companies are in one or more of their Shared Spaces. The insiders enjoy always on relationships, while excluded companies must pay for access—or are blocked completely. These Digital Boundaries and Shared Spaces let each user choose the kind of digital world they want to see on their screens. People changed entire industries when they took control of music and news. Next, the Expandiverse will let each person transform industries like unhealthy food (obesity and disease) and climate change (global warming from carbon-based fuels). People’s inclusive choices will strengthen the companies and industries they prefer. If you like fast food, you can include it in your Shared Spaces so its messages, content and choices are continuously connected to what you do and how you live. At the same time, consumers excluding choices will diminish products and services they banish. If you think fast foot is unhealthy for your family, you’ll control whether they ever appear on your screens. All of this is the same that you do today — you choose what your screens display—just updated to the 21st century. The metrics from Digital Boundaries are like real-time “votes” by consumers. These totals will have a huge impact on the design of products, services and consumer relationships. Every person will help guide a new “visible hand of the marketplace” — a green light for the kind of world we each decide to live in and buy. This “visible hand” will also be consumers’ kill switch on the world they want to avoid and see decline. People’s choices will evolve today’s consumer-centered world into the consumer-controlled world of Partnership Capitalism. Personal Digital Boundaries can be run as a service for millions of people by advertising services. Scale isn’t an issue. Today’s ad services already track everyone. They already profile, predict and personalize persuasion strategies — making your beliefs and actions the economy’s targeted bulls eye. Everything changes when each person controls their screens, and their always on connections with trusted companies. The user interface turns into the world’s most valuable real estate. Each user already owns and controls this central property. With Digital Boundaries and Shared Spaces, they will use it to direct the economy. Why would companies do this? There are many reasons why Partnership Capitalism is a win-win. As one example, Digital Boundaries and Shared Spaces could be promoted and managed by nonprofits and companies whose goals people want to support — education, the environment, family, community action, and many other causes. This will expand the revenues of nonprofits and companies by adding advertising services and business transaction revenues from managing consumers’ interfaces and purchases. They can also deliver Active Knowledge to rapidly raise the success of communities and industries, as well as individuals. Environmental nonprofits and renewable energy companies will help millions of people fight climate change and switch to renewable energy faster by banishing fossil fuels from their screens, and delivering Active Knowledge in Shared Spaces during daily living. These nonprofits will earn new advertising services and business transaction revenues that multiply their growth into larger and stronger voices. Weight loss companies and gyms can sell Digital Boundaries and enjoy Shared Spaces relationships that help members eat healthy, lose weight, improve fitness and live better. They also earn ad services and other revenues in addition to their usual fees. Each company now has new scalable opportunities to become an industry leader. Then it can grow its platform to help lead the world. Risks: Always on friendly guidance during daily work and life, to prevent losses by helping people make safer personal and and property decisions. Losses: Real-time incident identification, real-time assistance, immediate recovery (where possible) and embedded restoration activities throughout the rebuilding process. Continuous quality assurance: Become the trusted advisor that continuously improves connected consumption, personal safety, work on the job, recreation, and everything. Additional ad revenues: Earn ad services revenues from the companies that provide services and products that reduce risks and recover from losses. Additional business revenues: Earn a percentage of each transaction made with one of the companies that connects through the insurance company’s platform (like Amazon or iTunes). Sets of Digital Boundaries can also be saved and shared, making it simple to re-set your personal boundaries. When you want to experience a new way to live, just switch them in one or more Shared Spaces. It’s also easy to return to a previous set of choices, so you could grow by experiencing many of life’s best directions. Which do you like best? Which works best for you? These personal and group choices will change what millions of screens display or exclude. This new “visible hand of the marketplace” will trigger rapid growth by companies people want, while sectors people dislike will learn to adapt to a People-First Digital Economy—or remain shut out. Each person’s choices are visible signals to Responsive Companies and Nonprofits. Those trusted leading organizations will grow continuously connected relationships where they help shape and deliver the world people choose to live in. Why would companies do this? For the personally connected relationships with every consumer, and for the new revenues and growth opportunities. What leading company won’t want this? We are currently in the “early light bulb stage” of the Internet . Our connections are on/off : We go to a web site to use then leave it. We log into a banking service then log off when done. We make a Skype call then hang up. In the future we will develop Continuous Connections in always on Shared Life Spaces. We will live and work in new ways. You’ll have multiple Shared Spaces, and each Shared Space maintains all of its “always on” connections and states (which include people, tools, resources, services, IoT devices, sensors, and much more). You’ll also enjoy different kinds of Shared Spaces like family, friends, work, project teams, entertainment, recreation and other interests. When it’s time to work, you will often “telework.” You’ll have a Shared Space for a project at work, and will have an “always on” presence in that project’s Shared Space. If you’re on several project teams, you may be in each of their Shared Spaces as well as your department and company. This won’t overwhelm you because your Presence only becomes Active when you flip into a Shared Space, and your presence becomes Inactive when you flip out of that Shared Space. For example, you’ll flip into your family’s Shared Space and are Active with your spouse and/or kids. Then you’ll flip into a telework Shared Space where you’re Active with that team. You’ll have an “always on” Inactive presence in all your other Shared Spaces, so you can instantly be reached by any of them. It’s your decision whether or not to flip into it. As soon as you flip into a Shared Space, every part of it is always on. Instantly use all its tools, resources, sensors, subsidiary devices, and always on connections. The result: You have multiple “presences” in multiple Shared Spaces, that let you flip into each of the “you’s” that you want to be. You’re in the Expandiverse. You already know what multi-tasking is. Well, this multiplies you and what you do with your life. This could be called multi-living, as if there are multiple “you’s”). Will this be just telework and telepresence while you stay centered in today’s physical world? Or will this Expandiverse TeleLifestyle become a normal way to live? 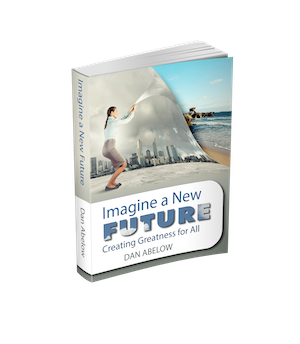 In it you will be a totally powerful world-class person everywhere. Humanity’s combined abilities will be at your fingertips everywhere. Digital Convergence is coming. 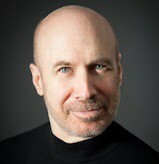 Today’s billion-user platforms will collide with each other and with industry-leading companies. A Winner-Take-All War will converge life, work, business, entertainment and everything. It will consume countless companies and industries, who will be forced to join a leading platform and pay them to connect with consumers and be part of their daily lives. Peace will come when the winners capture tomorrow’s digital infrastructure. With network effects they could rule for decades. Their world would be governed by a few long-term winners, and most companies losers. But now Expandiverse Technology adds a fork in the road, to a People-First Digital Earth. Leading companies receive new competitive advantages for staying leaders. Startups receive new ways to grow into tomorrow’s leaders. New Expandiverse Technology, thinking and strategy help companies accelerate to lead their industry first, then scale to help lead the world. This will be a People-First Digital Earth, with a Partnership Capitalist Digital Economy that is chosen by people and served by responsive leading companies: The Expandiverse. Breakaway strategies: How can your company defeat competitors and capture your industry? Then scale to help lead a successful planet?